“Howdy” is the first thing greeting viewers visiting Terry Burns’ website. He has had ample opportunities for folksy chats with people, too: the former 30-year chamber of commerce executive has a Texas-sized list of credits that include four nonfiction books, more than 200 articles and short stories, a chapbook of poetry, and stories in other anthologies. The Pampa, Texas, native has penned weekly columns for four separate newspapers for the past 17 years. Burns, who considers himself a “fifth generation Irish storyteller and fourth generation Texas teller of tall tales” also just completed two terms as president of Panhandle Professional Writers, one of the oldest writing groups in the nation with more than 350 members. 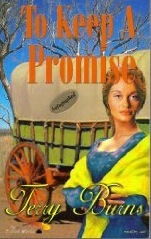 His latest work “To Keep A Promise ,” is his first published novel about a naïve young minister — intent on savings souls — who heads west with his new bride Janie and then is murdered in the course of his work. Befriended by two passing cowboys, Janie makes her way to Clarendon, Texas, a town established by Methodist ministers and dubbed “Saint’s Roost” for its piety in the midst of wild cow towns. Rich in western authenticity and Texan drawl, its e-book version was one of five finalists for the 2002 “Eppie” award, which recognizes the very best books originally published in electronic format. From his home in Amarillo, Burns talks with the Weekender about characters, his views on “Christian themes” and what creates a storyteller. Tell me about the book, and how the idea for it came about. This book was an assignment. I had written several other manuscripts and was pitching them to agents and editors, but my mother complained I always had a male lead in my stories. I wrote one with a female lead to satisfy her, and it was published by the first house I pitched it to. Needless to say I immediately started increasing the top female role in each other manuscript even if it wasn’t the lead character. Your novel has quite an eclectic cast of characters including a young widowed bride, two cowhands, an ex-prostitute and a young boy with a drunken grandfather. How would you describe the process of discovering one’s own self-worth? I wanted the lead character to be as dependent on her husband (and probably parents before him) as possible. A wallflower of a girl totally unprepared for what she would have to face. She found things in herself as the story unfolded that she did not know were inside her. She found the other characters herself as things progressed, and each interface was interesting in itself, but further served to define her. What does “To Keep a Promise” attempt to do and for what kind of reader was it written? It was written for my mother as a primary reader, and by definition beyond her to readers who enjoy a story that anyone in the family can read. It was particularly aimed at female readership, although the males who have read it have enjoyed it. Everything I write is not necessarily aimed at the Christian market, but everything reflects my Christian values, and never contains anything that would offend anyone with strong moral values. With all the turmoil in today’s society and more readers turning to Christian themes, how do you use those themes to draw in a more mainstream audience? I don’t use “Christian themes.” I use everyday, mainstream themes, things that people relate to easily, but a cast of Christian characters reacts to them differently than other people might. For example a manuscript I just finished has a young man who kills someone by accident and becomes hounded by the victim’s family. Nothing new there, right? Only if you throw in a strong Christian mindset to the character — he has to defend himself against those pursuing him without killing again. Makes it a whole different story than a traditional approach to the same plot question. After four generations of Irish storytellers, when did you first realize you were going to be the fifth? I suppose I’ve always known it. When my brother and I were little, much of our play involved making up stories where one of us would say, “Let’s play like we are doing so and so.” Then he would say, “and we are doing this and that.” Then we would go on and on, each sentence beginning with ‘and,’ which means in essence we would together write a story that was one big long sentence. My children played this game as well and I didn’t teach it to them. My daughter is a journalist and my son writes poetry. When people pick up a book, what do you think they look for most, whether it is answers, hope, entertainment? It can be all of the above depending on their mindset at the time, but given an absence of special situations impacting their lives, I would say it is entertainment. What do you most want to achieve with your writing? A mainstream writer that doesn’t sell thousands of books is not a success. A Christian writer who only sold one, but who changed that person’s life would consider themselves a success. This doesn’t mean I don’t want to sell a lot of books. I want to reach as many people as humanly possible, and I certainly wouldn’t mind a bit of an income stream to help my retirement, but the motivation is different. I don’t write for the Christian market per se and I’m never preachy, but I would like to get books out that are entertaining first and foremost, and if I can put a little bit of a Christian message in the hands of someone that might not otherwise see it, more the better. This article first appeared in the Weekender on October 10, 2002.